Reverse Mortgage Crowds - Welcome! Our reverse qualified lists including scrubbed landline phones, scrubbed cellphones and e-mails, will help you achieve more reverse closings. We have very competitive pricing, so check with us before you pay more than you have to. Reverse Mortgage Crowds, gives you more effective ways to find great clients with low-cost solutions that work! Reverse Mortgage Crowds, has been specializing in marketing strategies for Reverse Mortgages to seniors for over thirteen years. Edward Waldman took 29 years of sales, marketing and public speaking expertise, plus his love for seniors, and molded it into Reverse Mortgage Crowds. Ed specializes in accurate list sales of qualifying seniors (with scrubbed landline, cellphone and e-mails), precision seminar mailings and seminar presentation coaching. Ed has patiently assisted hundreds of individual loan officers and large companies with quick and easy implementation of programs to ensure success in the changing world of Reverse Mortgages. With the knowledgeable seminar execution, and cold call coaching plus e-mailing that Ed provides, you will improve your closing ratio even if you are a seasoned professional. 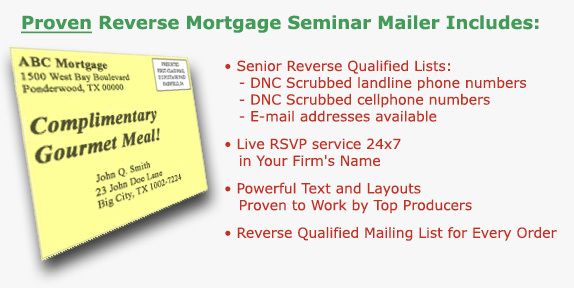 Reverse Mortgage Crowds, provides the most marketing, sales expertise, and support at the best price you will find in the Reverse Mortgage Marketing industry. Your return on investment is Ed’s main concern because he wants your business over and over again. Ed can help you get more qualified seniors quickly – either by phone, e-mail, mail or through seminars. Call him today - you will be glad you had a chance to speak with him. Reverse Mortgage Crowds, gives you more effective ways to find great clients with low cost solutions that work! Laws governing the content of advertising material vary from state to state. Also if you are affiliated with a NASD member firm you may be required to meet NASD regulations regarding the content of your mailers. It is your obligation to ensure that your mailer/invitation is in full compliance with all applicable state and federal laws, rules and regulations. Seminar Crowds Inc. (SCI) assumes no responsibility for the content of your mailer or compliance with applicable laws. Any forms, templates or suggestions provided by SCI are for convenience only and it is the mailers responsibility to ensure that his or her mailer fully complies with applicable law.